Pingo van der Brinkloev is a Danish artist and VFX expert who invites us to discover a superb animation video It’s Paper , containing several 3D animation sequences. 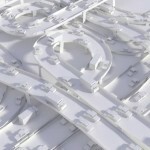 Simulating paper cities, this very successful creation was made ​​possible thanks to Cinema4D software. To discover in the future.